Workers Can Participate in CSB Investigations: A major goal of the Occupational Safety and Health Act is to encourage workers to participate in the process, including allowing workers to walk around with OSHA inspectors. When the Chemical Safety Board was authorized, the law required that workers be given the same opportunity to participate in facility investigations as provided by OSHA. In 2012, the CSB finalized a workers particiaption policy, but it was then classified as a confidential document. So how were workers to know they were allowed to participate in CSB investigations? Last week, the CSB voted 2-1 to revise that policy and issued it publicly. Board members Kristen Kulinowski and Richard Engler voted to issue the policy while Manny Ehrlich abstained. Calling workers “critical sources of information relevant to the investigation,” the new policy gives workers (or their representatives) the right to participate in the following activities: Investigation opening meetings, status update meetings, and closing meetings, site walk-throughs and on-scene investigation activities, equipment, material, and sample evidentiary testing; employee witness interviews; document requests; and review of draft written reports and recommendations. Can Safety and Productivity Co-exist? There’s a common myth going around these days that high profits and business success are incompatible with health and safety regulations and enforcement. Former OSHA head Dr. David Michaels disagrees. At the National Safety Council conference, Michaels recalls how employers would tell him that after a tragic fatality or other incident, they improved their health and safety program and not only saw injuries and illnesses decrease, but also saw gains in other areas of the business, such as quality and productivity. His observation were mostly anecdotal and now Michaels, a professor at the George Washington University, is looking to develop “methodologically sound, data-driven research that seeks to determine whether a true causal relationship exists between these areas.” It’s too late if you have to wait for people to get killed or seriously injured before you improve you safety program, according to Michaels. So they executives have to understand that organizational success, quality or productivity improvements, and other key business metrics go along with safe workplaces. Miners’ Lungs On the Agenda When Congress Returns: And speaking of coal miners, as we’ve noted recently, the nation’s coal miners are facing a surge in cases of black lung disease. The good news is that there is the Black Lung Disability Trust Fund, which provides federal benefits to some coal miners with the disease. The bad news is that a 10-year old excise tax on coal companies that supports the fund will be cut by half at the end of the year unless Congress acts soon. The Government Accountability Office has found that “the fund could be in serious financial trouble in the coming years unless the tax is reauthorized.” Senate Majority Leader Mitch McConnell has promised to address the problem as soon as Congress returns from its election recess so that miners don’t lose their benefits and health insurance. 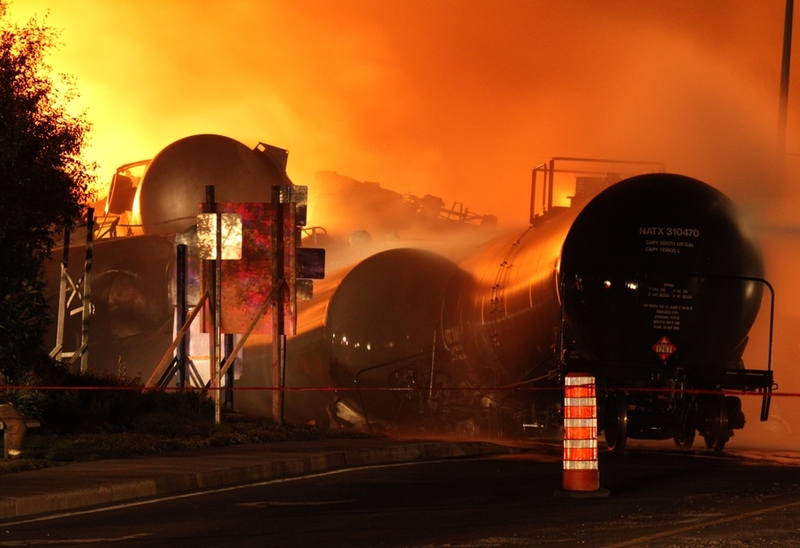 Learning the Lessons of Lac Megantic — or not: We’ve written a lot about the Lac-Megantic rail disaster that killed 47 people in the Canadian town when a train carrying 73 cars of highly combustible crude oil derailed in the small Quebec town of Lac-Mégantic in 2013 turning the downtown into a raging inferno. Now Bruce Campbell, the former executive director of the Canadian Center of Policy Alternatives and expert in oil-by-rail regulations, has written a book, The Lac-Mégantic Rail Disaster: Public Betrayal, Justice Denied which blames the disaster on rail deregulation in Canada in the 1980s and 1990s, industry-captured regulators, reduction in crew sizes, unsafe train cars transporting volatile oil, and corporate reluctance to implement costly safety measures. Campbell fears that while oil-by-rail shipments continue to grow, many of the problems that led to the disaster have not been corrected. “I saw a series of policies that progressively removed safety protections and gave increasing power to the companies. Its enabler, or sibling policy — austerity — weakened the regulator. It became more and more dysfunctional internally. Of course, [Canadian National Railway] was privatized, which further enabled this process.” There are lessons to be learned in the United States as well. Putting the Data to Work: In 2015, OSHA issued its “electronic recordkeeping rule,” the first phase of which required large and high hazard employers to send their injury and illness summaries in to OSHA. OSHA has now announced that it will be putting that data to work by using it in its “Site-Specific Targeting Program” which will focus inspections on high injury rate establishments (establishments with elevated Days Away, Restricted or Transferred — DART — rate) in both the manufacturing and non-manufacturing sectors. The program will also focus inspections on those establishments that did not provide the required 2016 data to OSHA in 2017. The 2017 data was due to OSHA by July 1, 2018. The original regulation also required employers to send in more detailed injury and illness data, but OSHA has proposed to repeal that part of the regulation. The Obama administration had also intended to post the injury and illness summary data on the OSHA website, but the Trump administration has so far refused. In addition, OSHA recently issued a memo weakening enforcement of language in the regulation that protects worker from retaliation for reporting injuries or illnesses. Next Post Next post: Why Vote? The policy itself (Procedure H) was never released publicly. There was a press release describing the “key elements”(https://www.csb.gov/csb-develops-policy-on-employee-participation-in-investigations/?F_All=y), but the policy itself was never published. You also promised in the press release that “Over the next few months, the CSB plans to develop a brochure for employees as well as a new web page summarizing the new policy.” That brochure and web page also never appeared. Still, there is nothing on the record that sustain your claim that the CSB Worker Participation in Investigations Policy of 2012 was: “classified as a confidential document”. On the contrary, you said correctly in your comment of October 31st of 2018 –that there was a press release describing the elements of the policy (BO 40). The 2012 Worker Participation Policy was produced after a public meeting with labor and community organization participation. The press released provided detailed descriptions of 10 of the policy elements of Worker Participation–nothing confidential about that. This was complemented afterwards with a CSB policy on Victims and Family Participation (BO 47). I believe the issue was covered in depth and made available to the public. It is not to say that there is not room from improvement, and I applaud the board for issuing an expanded Worker Participation Policy (BO40A) in 2018. However, the point should be made– in the interest of full disclosure –that internal administrative policy guidelines from the CSB (Board Orders 40, 40A, 47) do not confer any additional legal rights to workers. They are internal guidelines to the CSB staff subject to changes –at any time by board votes. They are nevertheless worthwhile efforts to provide guidance to CSB investigators.